Three LP set. 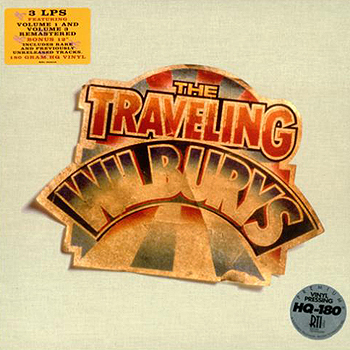 Disc 1 (tracks 1-10 w/1-5 on side 1 and 6-10 on side 2) is the original Volume One Traveling WIlburys LP. Disc 2 (tracks 11-17 w/11-13 on side 1 and 14-17 on side 2) is a bonus LP with the 4 bonus tracks that are also on the CD version of this release along with 3 additional bonus tracks (tracks 12, 15 and 17). Disc 3 (tracks 18-28 w/tracks 18-23 on side 1 and 24-28 on side 2) is the original Volume Three Traveling Wilburys LP. First copy is sealed (unopened) and second copy is not.